Filling an open position with the right candidate is an important yet challenging task. By the time a candidate makes it to the interview phase, the less qualified applicants are no longer contenders, making it your job to find the best option among the most qualified candidates. Picking a new hire is an investment, and making the wrong decision can adversely affect your company. If you hire the wrong person, you could end up wasting valuable financial resources on the recruitment process, training or severance, in addition to potential problems that could arise with customers or fellow employees. These are some red flags to look out for to ensure you pick the right person. If a candidate does not show up prepared for an interview, you cannot expect them to show up prepared for work. There are a number of ways to catch an unprepared candidate. The first (and most obvious) red flag is when a candidate shows up late. Barring serious family or medical emergencies, tardiness without a prior phone call can be indicative of the candidate’s inability to leave room for error or to prioritize. Another way to evaluate candidates before you even begin speaking with them is to ask them to bring information and materials to the interview, including two copies of their printed resume, professional references, licenses or certificates they hold, and two forms of identification. This information will be helpful when selecting a candidate and will also show his or her ability to follow instructions. Make sure that the candidate has the appropriate demeanour and dress for the occasion. What you deem appropriate will depend on your company and the position, but you will want to take note of your first impressions of the candidate. A good candidate will be enthusiastic and eager about the interview, and you should be able to see this from the moment he or she walks through the door. An ideal candidate will be dressed in clothes appropriate for your office—if not nicer—and should be well-groomed. If a candidate is late, under dressed or unenthusiastic, you may consider these red flags. You will want to ask your candidate a number of questions to make sure they have the experience necessary to handle the position they are applying for. Make sure to ask open-ended questions that force the candidate to elaborate. Professional Experience: Ask questions that will illuminate a candidate’s work history and will help you understand their job skills. Red flags could include failing to provide specific examples or numbers to prove their success, holding no degree or having no relevant experience in the field they are seeking to enter. Keep in mind, however, that for some fields, a lack of education or relevant experience may vary in importance (for example, many software companies have found no notable correlation between higher education and success as a developer). Preparation:Ask questions that will reveal the candidates’ feelings about and knowledge of your business. Probe their understanding of and (perhaps even more importantly) their interest in your industry and your company’s goals. Red flags could include an obvious lack of research regarding your business or a lack of enthusiasm or experience in your field. Team Spirit: Ask questions that will help judge the candidate’s ability to work with a team, fit into the culture and resolve conflict. Red flags could include hierarchical thinking (for example, only focusing on pleasing senior-level employees), a need to “beat” or compete with co-workers, or a lack of experience collaborating with others. Resilience: Ask questions that help you understand how a candidate will handle stressful situations. Ask candidates to explain a situation in the past that caused them anxiety or stress and how they handled it. Red flags could include the inability to handle stress, taking their stress out on other people or not being aware of health risks to themselves or their fellow employees. Result Orientation: Ask questions to see if your candidate is focused on meeting your company’s goals while also setting personal goals. Red flags may include having no personal or professional goals, having goals that conflict with those of the company, or having no examples of achievements or positive results. Persuasiveness: Ask questions that will provide insight on your candidates’ ability to convince others of their views and how they will handle it when they are unable to do so. You can test candidates’ persuasiveness by asking them to imagine a scenario in which they are asking you to fund a project; what would they say to convince you? Red flags may include a candidate’s lack of decisiveness, an inability to elicit emotion or empathy, or continuing to push an argument that is not working. Initiative: Ask questions that will probe your candidates on their ability to set challenges and personal goals, and judge their likelihood to take on greater responsibility. Red flags may include risk avoidance, unwillingness to embrace and promote change, or a lack of personal awareness. Customer Orientation: Ask questions that show the candidate’s ability to represent your company to customers and to address their needs. Red flags may include a lack ofcustomer-service experience, not thinking about every customer’s needs equally, or setting their own priorities higher than that of the customer. Responsibility: Ask questions to see if candidates take responsibility for mistakes they have made and how they react to making mistakes. Ask them about a professional mistake that they’ve made in the past and what they did to rectify it. 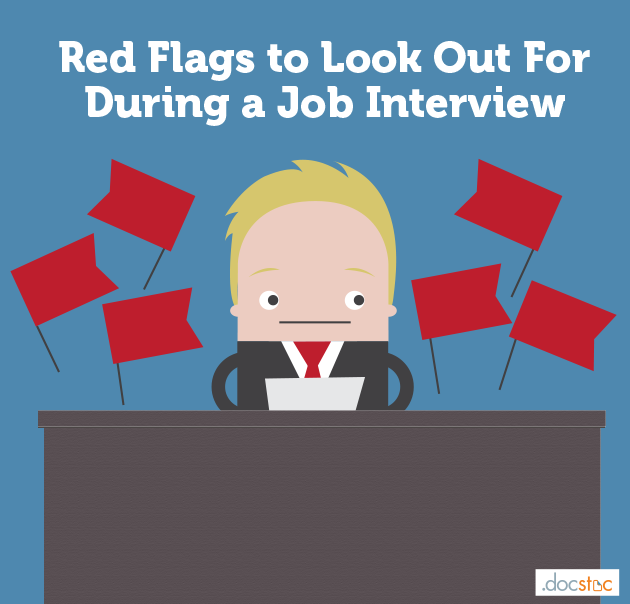 Red flags could include denying making mistakes, having little to no responsibility in their current job, or exaggerating in order to look like a stronger candidate. If you suspect a candidate is stretching the truth, you should check with his or her references. Finding answers to all of these questions should not only give you a great background on your candidate, but it should also offer insight into his or her communication skills. Many candidates will have pre-rehearsed responses to your most basic questions, but giving them prompts and asking them to improvise will give you the opportunity to hear how they might react on the fly in a professional setting (and may also reveal some red flags in the process). Make sure you pay attention to non-verbal cues during your interview. This means watching how a candidate acts while answering your questions. You will be looking for a candidate that is attentive throughout the entire interview. If a candidate’s eyes wander, or if they slouch or lean back for most of the interview, this may indicate a lack of attention or interest in the discussion. Once you finish asking the candidates questions about their job experience, you should give them an opportunity to ask questions about the position and/or your company. This is a good chance to see if candidates have a good base of knowledge about your company and if they are truly interested in the job itself. Red flags would be asking no questions at all, failing to ask insightful questions (for example, asking “so what exactly does your company do?”) or if they only care about the benefits or perks of the position they are applying for.